Rep. Frank Pallone does not like the idea of bringing back the Select Committee on Energy Independence and Global Warming. 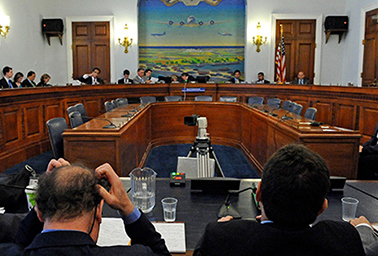 The New Jersey Democrat, who is poised to lead the Energy and Commerce Committee in the next Congress, yesterday called the proposed revival of the select panel unnecessary. "I just think right now we have great people who want to take action on climate change who would be chairing the committees of jurisdiction. We got a lot of people on the committees that are real champions, so I don't think it's necessary," Pallone told reporters last night in his first remarks on the proposal that has emerged as a priority for Minority Leader Nancy Pelosi (D-Calif.), who also aspires to be House speaker next session. Pallone's comments mark a mixed-up rehash of what happened last time Democrats instituted the select committee, from 2007 to 2010, when the panel held dozens of hearings and briefings but didn't have the power to pass legislation. Then-E&C Chairman John Dingell of Michigan was a staunch defender of his committee's jurisdiction as well as the auto industry, and he felt Pelosi had gone around him (Climatewire, Nov. 13). Pallone's concerns are different. He's a longtime climate action advocate. But his message is similar: The select panel is useless. 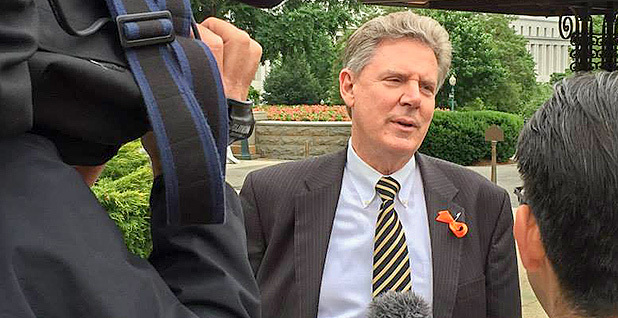 Pallone, the Energy and Commerce Committee's current ranking member, noted the select panel would be a "fact-finding panel" without the authority to move legislation. Pelosi, meanwhile, underscored her push for the panel yesterday after climate activists, led by Rep.-elect Alexandria Ocasio-Cortez (D-N.Y.), staged a protest in the leader's office seeking action on a host of environmental priorities (Greenwire, Nov. 13). Asked whether he had raised concerns with Pelosi, Pallone said, "The way I tell you I tell anyone who asks: I just don't think it's necessary." Pelosi and Pallone are not especially close. She backed Rep. Anna Eshoo (D-Calif.) for ranking member of E&C in 2014 against Pallone, who prevailed. Since then, though, they have found common ground working on health care legislation. Pallone's opposition could also frustrate greens who heavily campaigned for Democrats this cycle and see the panel as a way to focus attention on global warming. Still, he may not be alone. Rep. Don Beyer (D-Va.) said other standing committee chairs "aren't excited about a committee that could potentially take away some of their power." For instance, Rep. Richard Neal (D-Mass. ), who is in line to lead the Ways and Means Committee, might want to make sure any carbon-pricing legislation goes through his panel, Beyer said. There's also some debate among Democrats about what the select panel's role would be. Last time around, Pelosi stressed that the panel had no legislative jurisdiction, and Pallone suggested that's the way it would be again. But Ocasio-Cortez and the progressive wing of the party are pushing for it to have more teeth this time, and Pelosi told The New York Times that its reincarnation would pave the way for energy efficiency measures and legislation to reduce emissions. In any case, Rep. Jared Huffman (D-Calif.) said Democrats would find a way to "navigate the jurisdictional tension." The select committee would likely serve a "coordinating function" among the standing committees of jurisdiction, he said. Huffman, who co-chairs the Democratic Environmental Message Team, likened its potential role to the White House Council on Environmental Quality, which coordinates environmental policy across the government and performs "air traffic control." "Everyone understands that E&C has a really broad jurisdiction," he said. "And I really don't think this threatens the pre-eminence of the E&C Committee as the place where a lot of the policy — particularly on the energy side — is going to take place." Some Democrats are excited about a potential revival of the select committee but said the full details are yet to emerge in internal conversations. Huffman and Beyer both said they would like to be on the panel, and Rep. Don McEachin (D-Va.) said he would be open to it, as well. As for the chairmanship, "there will be the usual dogpile of members interested in a gavel in their hands, so we'll see where that goes," Huffman said. McEachin added that he was "unaware of any conversations" as of yet about who would take the gavel. It's also unclear who would take the Republican side of the committee. Advocates such as the Citizens' Climate Lobby — the group behind the bipartisan Climate Solutions Caucus — are hoping the GOP members come from the section of the party that has voiced concern about climate change. Rep. Brian Fitzpatrick (R-Pa.), co-sponsor of Florida Republican Rep. Carlos Curbelo's carbon tax bill, is one possibility in that vein. Beyer said he would "love" to lead the select committee but suggested that Pelosi might prefer someone in that position who isn't a white man, especially given the surge of women who are set to take office in January. "I think I know her well enough to know that she will want to make the committee look like not just Congress, but look like the various communities that we represent," Beyer said. "For example, I think she'll have a strong emphasis on environmental justice. Make sure that it's not just coastal people from affluent communities." Beyer added that it would be a "lose-lose" proposition to embark on a fight over the climate committee's jurisdiction. But he said that if it simply exists to raise awareness, "that'd be really valuable, especially in an era when the Trump administration removes the words 'climate change' from every website."